The online reputation is one of the top 3 assets that we all need to nurture. The way a company discovers generates, understands and responds to reviews, ratings, and comments about their products, services, and the company overall, will differentiate them as a winner or a loser. You agree right? You agree that words shared by customers are a serious asset that you will need to find a way to manage them. It is the fundamental process of building power users and nurturing their trust. Most of the companies do this by asking the most engaged customers to send them a few kind words that they will later display them on a website. We want a fresh testimonial every single day. Words that will dynamically display on our website and we will no need to interfere in the content. And the best place to get these testimonials is …. you guessed it. Facebook! Have you ever wondered how you can actually use Facebook reviews and display them on your website?! In an epic guide to Facebook Reviews that we recently published, we explained how to activate Facebook reviews on your Facebook page and what you can do to make the most out of them. To use these websites and get the user-generated content help you convert on your web store, we suggest you display the Facebook reviews on your website. Show social reviews, boost trust on your website and increase conversions. 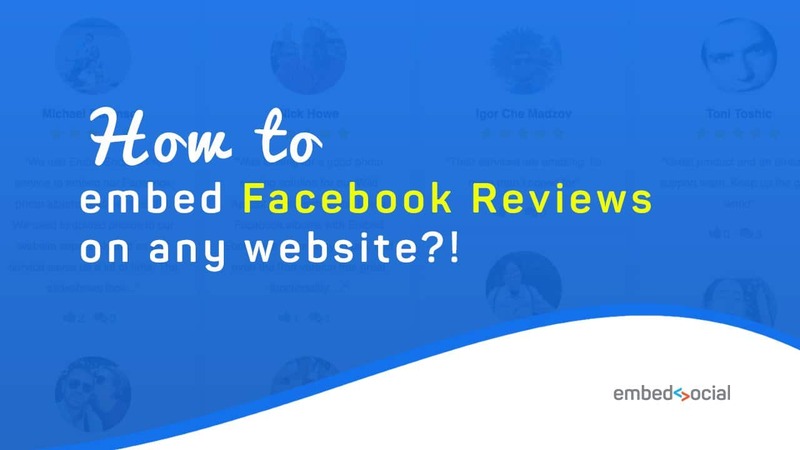 There are two methods that will help you to embed Facebook reviews on a website, manually and automatically with a plugin. 4. Go to your website HTML or CMS (WordPress, Joomla, Drupal) editor and paste that code. Here is an example of the review that I embedded manually from our Facebook Page. You do not need any coding skills. 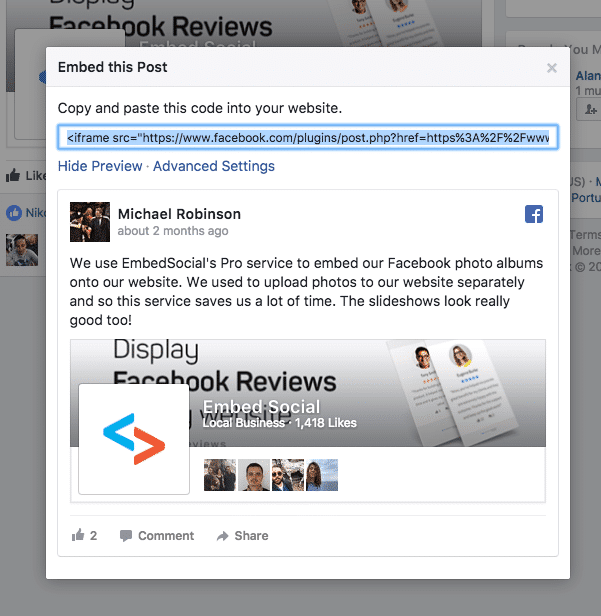 We’ve built an Embed Facebook Reviews Plugin that can display your Facebook’s Page reviews on any website. 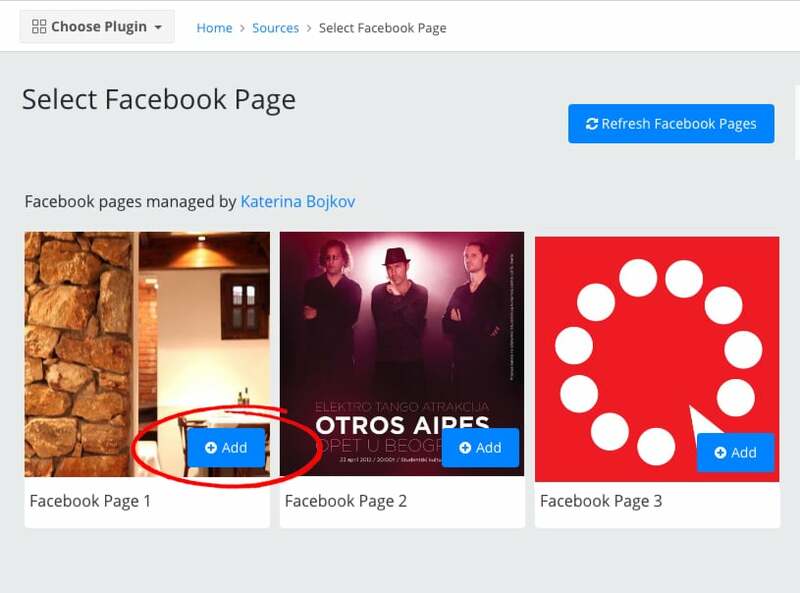 It literally generates all your customers’ reviews on Facebook and lists in your EmbedReviews account. To do this, you will need to log in to your EmbedSocial account. If you need one, go and get a free trial here. To display them on your website, just copy and paste the top-right code into your website body section. That’s it. Once you add the code, the system will automaticly display the Facebook reviews widget on your website. 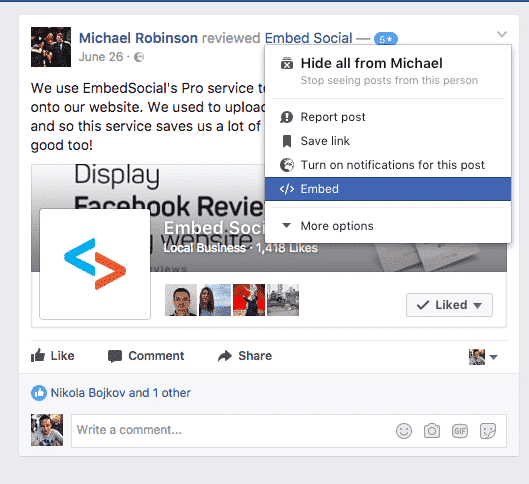 The EmbedReviews plugin has advanced options that will help you to customize the look of the Facebook Reviews embedded on your website. 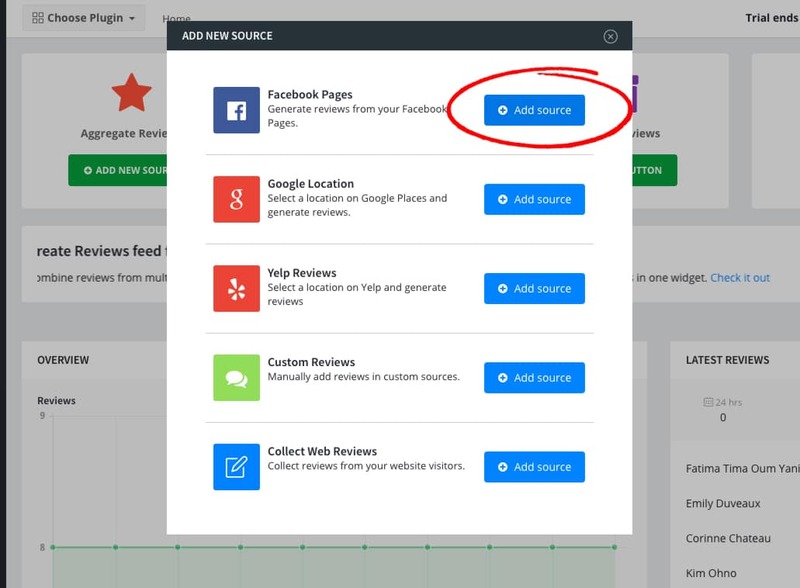 Once you customize the look of your Facebook Reviews widget, you can embed it on any website. 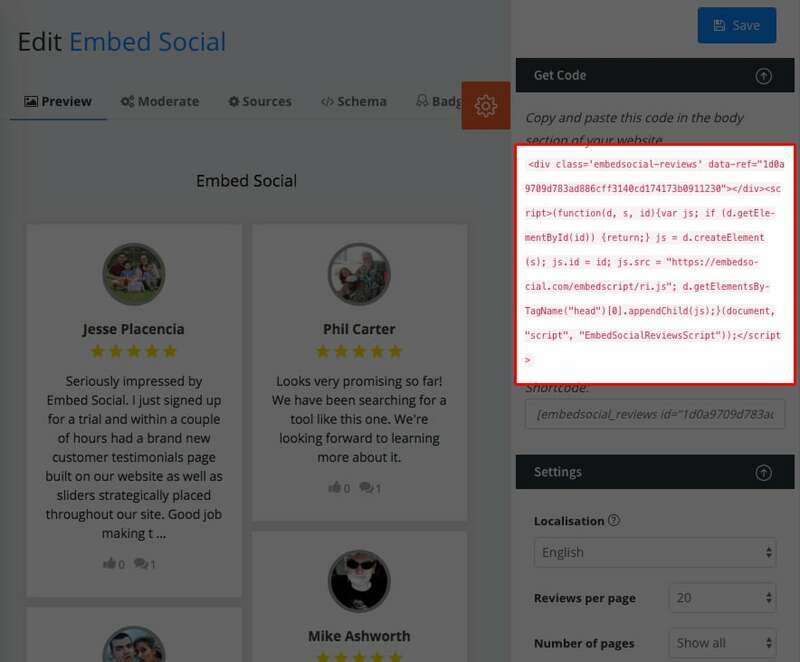 To embed the Facebook reviews on your WordPress website you just need to copy paste one line of code. No coding skills are required. So, copy the code that is displayed above the settings bar. Open your WordPress post text editor and paste the code. Click Publish and you will see your Reviews in action. Here is a sample widget of the Reviews published on our Facebook Page. That’s it. Simple and in seconds. Looking for a Facebook reviews plugin? Generating, updating and displaying reviews on your website takes lots of resources. 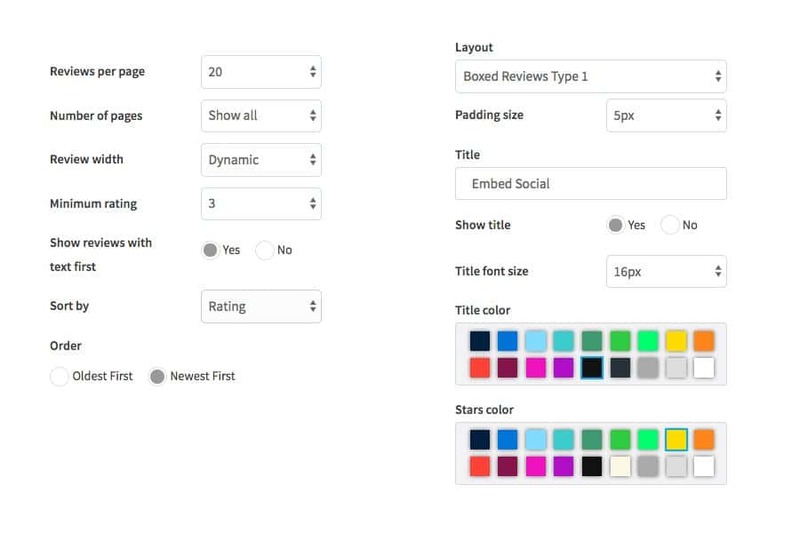 To help, we’ve developed EmbedReviews a full featured reviews management tool that will make your life much easier. Sign up for an account, now! Get access to our reviews manager and never miss another Facebook review or the chance to build full review feed widgets that you can embed on your website. Let me know if you have any questions about the reviews on Facebook or if you have any feedback. Post them in the comments below or use the share buttons to spread the word among your friends.